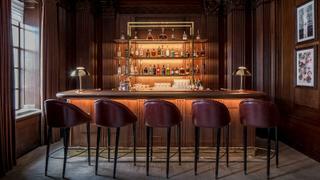 Opened in mid-2017, the Ten Trinity Square members club is housed in the former Port of London Authority building on the banks of the Thames, as part of a development which also features a new Four Seasons hotel. 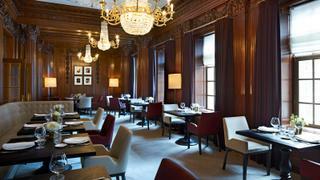 An exclusive hideout, which among other amenities boasts the UK’s largest collection of Château Latour wines, Ten Trinity Square sports an interior design which retains the building's naval character and listed woodwork while highlighting its history through modern pieces which reference seafaring motifs and early world exploration. Here designer 4Bi & Associés take us inside its sensitive reimagining of this historic building... Chairman's Lounge This is one of the first rooms you see when entering the club and one of the most lavishly adorned. Very formal, its walls are dressed with listed woodworks and soaring Corinthian columns carved with precious and luxurious neoclassical details. The chandeliers in blown opal glass, the tassels, the beautiful original mouldings of the ceiling and the copper elements have been beautifully restored to express their original magnificence and give the room a unique soul. 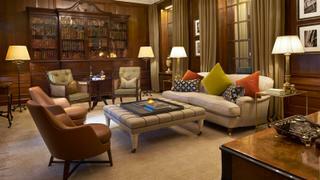 Comfortable leather club chairs and velvet sofas are set beside the fireplace in classic British style. This room respects the past with traditional works of art, while giving it a new life thanks to modern pieces, making it the perfect place for both official and convivial meetings. This is one of the first rooms you see when entering the club and one of the most lavishly adorned. Very formal, its walls are dressed with listed woodworks and soaring Corinthian columns carved with precious and luxurious neoclassical details. The chandeliers in blown opal glass, the tassels, the beautiful original mouldings of the ceiling and the copper elements have been beautifully restored to express their original magnificence and give the room a unique soul. 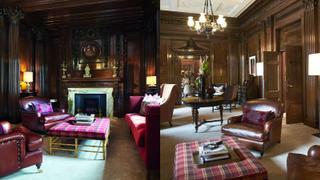 Comfortable leather club chairs and velvet sofas are set beside the fireplace in classic British style. This room respects the past with traditional works of art, while giving it a new life thanks to modern pieces, making it the perfect place for both official and convivial meetings. This space faces the Chairman’s Lounge and is designed to provoke a protective emotion with its elegant, muted atmosphere. Thanks to its silky beige carpeted floor, heavy wool fabrics, ornamental plasterwork ceiling and wax wood-carved walls, sounds are absorbed to create a studious feel. This is a perfect setting for meditation, enhanced by the large original library complete with a collection of finely crafted tomes. Paying tribute to the British influence overseas and trade between the United Nations and the Americas, the cigar lounge adopts a true Cuban vibe. The Havana design language is written through a range of luxurious materials: aged mirrors, fans on the ceiling and banana leaves laid on the walls in the style of a parchment wall covering. Inspired by the bench seats of British classic cars, the precious leathers of the bespoke furniture are tinted in a natural tobacco palette to resemble the maturation steps of a growing and drying tobacco leaf. To create a feeling of relaxation and cosiness, the large volume of the bar area is subtly divided into an impressive wooden counter and adjoining comfortable lounge. The original mouldings have been reinterpreted into a modern structured pattern centred around a bespoke brass shelving unit on which the liquor bottles catch the eye in their glazing frame and contrast with the imposing marble plate at the rear of the bar. To complement this, the counter top features copper details and brass rounded lamps and is finished with a large leather-edge and wine-coloured leather high chairs. 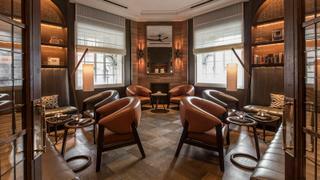 The lounge is very welcoming in a truly British sense, with a padded leather low table and seats covered with Scottish mohair and velvets, to create a harmonious and familiar setting. The listed panelled walls match the tone of the counter and the metal details atop the doors add subtle visual interest. To create a feeling of relaxation and cosiness, the large volume of the bar area is subtly divided into an impressive wooden counter and adjoining comfortable lounge. The original mouldings have been reinterpreted into a modern structured pattern centred around a bespoke brass shelving unit on which the liquor bottles catch the eye in their glazing frame and contrast with the imposing marble plate at the rear of the bar. To complement this, the counter top features copper details and brass rounded lamps and is finished with a large leather-edge and wine-coloured leather high chairs. The lounge is very welcoming in a truly British sense, with a padded leather low table and seats covered with Scottish mohair and velvets, to create a harmonious and familiar setting. The listed panelled walls match the tone of the counter and the metal details atop the doors add subtle visual interest. 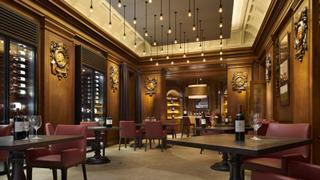 Designed to be a British interpretation of the French Chateau Latour vineyard, the tasting room is the crowning jewel of Ten Trinity Square. Inserted inside former window embrasures, modern steel wine-coolers preserve exquisite bottles and are surrounded by wooden-panelled walls depicting famous London figures from the 14th to 18th centuries including Lord-Mayors of London, philanthropists, painters, architects and military men. From the feature ceiling hang bubble lights on metal rods resembling a starry sky and emitting a light that embues mystery and emotion. Inspired by the lights hanging in the Chateau Latour cellars, the soft light picks up the Bordeaux soil tones while the link between the Pauillac vineyard and London is illustrated through pictures of the Bordeaux estate. Designed to be a British interpretation of the French Chateau Latour vineyard, the tasting room is the crowning jewel of Ten Trinity Square. Inserted inside former window embrasures, modern steel wine-coolers preserve exquisite bottles and are surrounded by wooden-panelled walls depicting famous London figures from the 14th to 18th centuries including Lord-Mayors of London, philanthropists, painters, architects and military men. From the feature ceiling hang bubble lights on metal rods resembling a starry sky and emitting a light that embues mystery and emotion. Inspired by the lights hanging in the Chateau Latour cellars, the soft light picks up the Bordeaux soil tones while the link between the Pauillac vineyard and London is illustrated through pictures of the Bordeaux estate. This convivial dining room is furnished with a variety of seating options (large padded sofas, private or duo table units) dressed in gravel and burgundy colours relating to the roots of the Chateau Latour wine. The stunning chandeliers date from the origins of the building and it is this association between old and new which inscribes the club with a timeless spirit.